The National Weather Service has issued a flood warning for the Kennebec River from Tuesday morning to Wednesday evening. 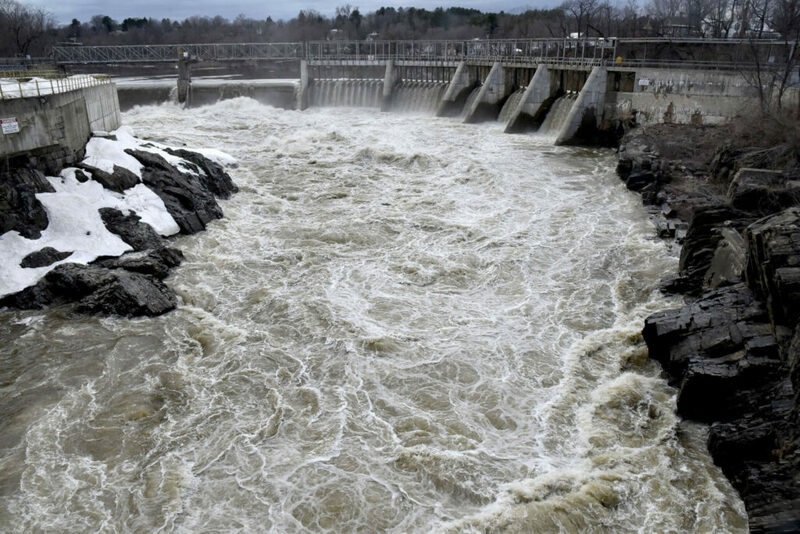 AUGUSTA — The National Weather Service in Gray issued a flood warning for the Kennebec River in Augusta and Skowhegan Monday as the level of the river continued to rise, but forecasters don’t expect the flooding to be severe. The flood warning for Skowhegan was expected to be in effect from Monday evening until Wednesday afternoon; for Augusta, the warning covers Tuesday morning through Wednesday evening. Eric Sinsabaugh, meteorologist with the National Weather Service in Gray, said winds moving in Tuesday and cooler nighttime temperatures will slow the melting in the snow pack across the northern Kennebec Valley. Rain is expected to start again in the early hours of Thursday and continue through the day, Sinsabaugh said. “It will be less impactful, and we’ll see little if anything,” he said. The National Weather Service recommends that motorists not drive through flooded areas, as it is impossible to know if a road is safe for travel. “Turn around, don’t drown!” the warning says. Officials urge people to stay tuned to developments by listening to NOAA weather radio or other local media outlets. Public safety officials in southern Kennebec County have taken precautionary actions and issued advisories of their own. In Augusta, the Front Street parking lot was closed Monday afternoon, and downtown residents and merchants using the lot were advised to find other parking. 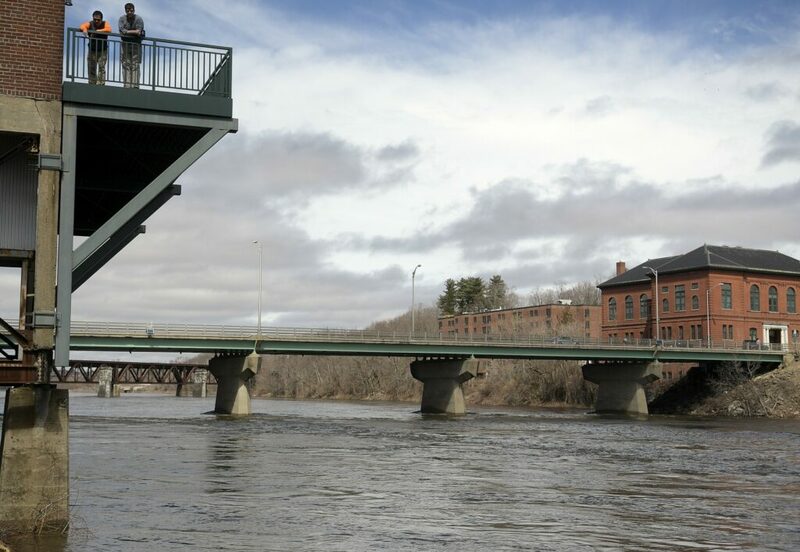 Sean Goodwin, Kennebec County Emergency Management Agency director, said signs were posted in Hallowell, and downtown residents and merchants there have been warned about the rising river level. “If it stays at 13.4 feet, that’s not bad,” Goodwin said. As of about 5 p.m. Monday, the Advanced Hydrologic Prediction Service indicated the river was at 9.22 feet and is predicted to reach 13.4 feet Tuesday during the day in Augusta. Minor flooding occurs when the river reaches 12 feet. On Sunday, Goodwin said the river was predicted to reach between 14 feet and 16 feet, but as conditions changed, the prediction was revised. On Monday, Seth Kruse took a mid-afternoon break from work at CCI Alliance of Companies to walk his dog Colter along the Augusta waterfront. Kruse said he’s lived in downtown Augusta for two years and watched in January 2018 when an ice jam backed up water into the parking area. “One of my neighbors left his car in the lot,” he said, and when the water rose, it covered the vehicle; only the tail lights were visible under the water. This time around, he said, the only inconvenience is likely to be finding another place to walk his dog. He was planning to find someplace else to leave his car beyond the reach of the river. Cushnoc Brewing Co. is one of the Augusta businesses that has space on Front Street. 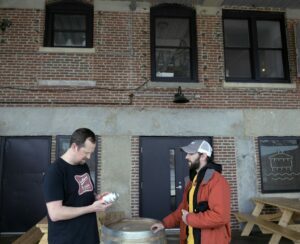 When the company was adding its tasting room, which opened a little less than a year ago, it took the possibility of rising waters into consideration. Casey Hynes, one of the partners in the craft brewery and restaurant, said the business is prepared. If the river were to rise high enough to reach the tasting room, the water would flow in and flow out, leaving behind a cleaning job. The closure of the parking lot is not expected to affect the tasting room, as it is closed on Mondays and Tuesdays, he said. Carla Cyr had driven into Gardiner from her Farmingdale home Monday morning to watch the river and eat her breakfast. By afternoon, she had made her way up to Augusta. Cyr, now retired, remembers seeing floods along the river for most of her life. When she was a young child in Farmingdale, her father was a vice president at Augusta Savings Bank on Water Street in Augusta, where she visited him one day in the 1960s. During the Flood of 1987, she came down from Bangor where she was living and took photos and recorded videos of the flooding. She particularly remembers all the stuff that got caught up in the train trestle and catching sight of what initially looked like a submarine but turned out to be a propane tank floating down river.